Limited Edition of 1000 Copies on Orange Double Vinyl in Gatefold Sleeve. 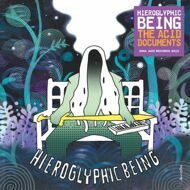 The Acid Documents – is an album made up of tracks first released last year only ever available in a bespoke edition of 100 copies – in the form of a homemade CD-R – made exclusively for the Sounds of the Universe record store. This album is now released officially as a one-off edition of 1000 copies on coloured double vinyl, fully remastered with artwork by Japanese artist 2Yang.